A screenshot of Google Earth, showing the locations of the 26 salt furnaces once located in the Bend Area. As I wrote last week, it was in 1849 that Rev. Moses Michael, John Hall, and John McCullough financed the first successful salt well in the Bend Area, at West Columbia, following failed attempts in Meigs County. And like the Ruffner Brothers’ success in 1808, it set off a chain reaction. The following year, the West Columbia well was sold to William Stephens, Thomas Friend, and Abraham Williams out of Wood County, who deepened the well to 1000 feet and built a full salt furnace. The Friend Furnace, as it was known, stood opposite Tin Can Hollow Road. Less than a year later, in April of 1851, the Pomeroy Salt Company was incorporated to finish the well started by James Blunden in 1848. The was, without a doubt, one of the best prepared companies in our area. Comprised of industrial genius Valentine B. Horton, his brother Horace, C.R. Pomeroy, Marcus Bosworth, and an investor from Cincinnati, they started with an investment of $25,000. With that, they brought in experts from the Kanawha Valley to finish the first well, drill a second one, and build a salt furnace, all of which was finished and in operation in less than a year. Within 10 years, the Pomeroy Furnace was followed by the Leadington Furnace at Silver Run, Coalport (later Diamond) and Dabney Furnaces in Middleport, Sugar Run and Excelsior Furnaces in Pomeroy, and Coal Ridge Furnace at Kerr’s Run. Then, in the post-Civil War boom, those furnaces were enlarged and followed by the Buckeye in Pomeroy, Minersville and Windsor Furnaces at Minersville, Sutton Furnace (later the White Rock) at Carletonville, Syracuse Furnace, Racine Furnace, and Riverside Furnace at Antiquity. But the south side of the Bend was not to be left out. Hartford led the way with the Hartford City, Valley City (later the Liverpool), Jackson, and German Furnaces. The Hartford City Salt Company also owned a second furnace, the Union, in New Haven. In Mason, we find the Mason City and Hope (later the Dixie). In Clifton, the Bedford Company built two furnaces, the Bedford and the Virginia. In the Narrows, between Clifton and West Columbia, the Burnap Company built the Quaker and Newcastle Furnaces. And finally, in West Columbia, the original Friend Furnace was replaced by the Beacon Hill (later known as the King, Crescent, and Harmony). By 1870, 20 years after the Friend Furnace opened in West Columbia, there were a total of 26 salt furnaces in our Bend, and between them, they were producing upwards of 5 million bushels of salt per year. Compare this to the Kanawha Salines, which you may remember from last week had 40 furnaces and produced over 3 million bushels of salt in 1846. By 1870, they were down to 9 furnaces and roughly half their former production, and within another decade, all but one would close. For the next 30 years, the Bend Area experienced prosperity unrivaled in its history before or since. In fact, for a short time it looked as if the towns of the Bend Area would eventually become one large city! It was because of the salt furnaces that the coal mines, sawmills, coopers, and blacksmiths had constant work, and it was because of this massive industry that other businesses were able to thrive. The other factories, breweries, general stores, jewelers, tailors, and even the opera houses owed their success to the salt industry. Unfortunately, it wasn’t set to last long. The discovery of rock salt in Michigan, which could be cheaply mined and shipped via the Great Lakes and Mississippi River to nearly every major city, killed the Bend Area’s salt industry just as our cheaper shipping costs had killed the Kanawha Valley furnaces. The owners organized the Ohio River Salt Company to manage production and prices as the Kanawha furnaces had, but it only prolonged the inevitable. The Bend was still strong enough in 1884 to survive that year’s disastrous flood, and they likely would’ve lasted longer had events not spiraled from there. In 1887, a fire destroyed most of the Hope Furnace and what was left of the Mason City. Valentine B. Horton’s death in 1888 resulted in poor management at many of the Ohio furnaces, and they fell to competition. The Great Clifton Fire of 1893 destroyed the two furnaces there, never to be rebuilt. In a time of fierce competition, even the smallest production delays could bankrupt a furnace, and that’s exactly what happened at many of those on our side of the river. Finally, the survivors were finished off by the 1913 and 1937 floods. Of the 26 furnaces in operation in 1871, only the two largest, the Liverpool and Excelsior, survived into modern times. Liverpool finally closed in 1963. Excelsior likely closed around the time, though I can’t find an exact date. Information from Anna Lederer’s “19th Century Coal and Salt Drama of the Pomeroy Bend,” the writings of Mildred Gibbs, and the Weekly Register. 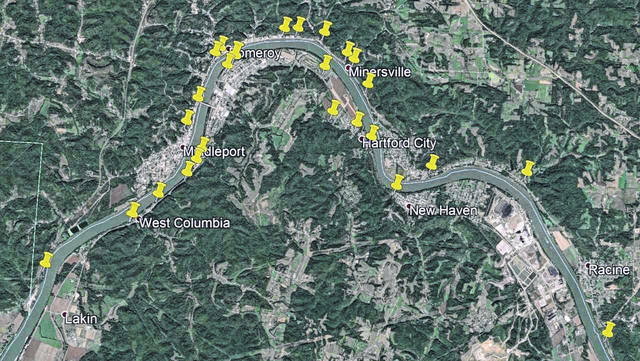 https://www.mydailysentinel.com/wp-content/uploads/sites/14/2019/01/web1_1.26-Map.jpgA screenshot of Google Earth, showing the locations of the 26 salt furnaces once located in the Bend Area. Chris Rizer is president of the Mason County Historical and Preservation Society, reach him at masonchps@gmail.com.